In order to better prepare your trip to Merzouga, and Morocco, Hostel Africa has prepared a comprehensive travel guide. 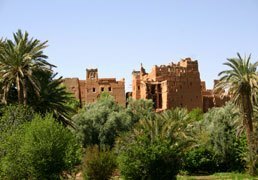 Thanks to this guidebook, you will not miss anything of what must be seen in Merzouga and its region, the Tafilalt. 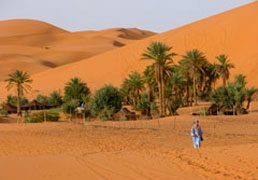 If you do not plan to stay only in Merzouga during your stay, Africa thought about everything and offers a study about Morocco with a wealth of practical information to prepare your journey in the Kingdom of Morocco. Dealing with cooking, culture, landscapes not to be missed, in short, it is the essential guide to be read before you go on vacation! In addition to its breathtaking landscapes, Merzouga offers many activities to the visitors. 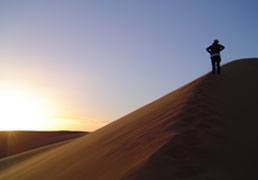 Discovering the large sand dunes of Erg Chebbi is a must in the region but it is also possible to walk near the lake, to swim in the sand, or even practice sports. The most popular activity is first and foremost the Berber bivouac on camelback, which will lead you to discover the oases of the Sahara and magical nights under the stars. Merzouga is a small town located in the south east of Morocco, at the entrance of the Sahara Desert. It is located about 30 miles away from the Algerian border, 20 miles from Rissani, and approximately 30 miles from Erfoud, the capital of Tafilalt. Sun, palm trees, Sahrawians palaces, lush gardens, bustling souks and spicy tagines… These are the words that come up most often to describe Morocco, its landscapes and its special atmosphere. This postcard is only a reflection of reality and secrets that offers one of the most beautiful countries in the world.